Growing Closer To Nature -Why the fuss over phytic acid? Growing Closer To Nature -Why the fuss over phytic acid? Growing Closer To Nature Episode 6 – Why the fuss over phytic acid? In episode 6, I am talking about what phytic acid is and how to avoid or use it for your benefit. Many of you have been hearing about phytic acid but I am sure there are many who haven’t. During episode 6, I will explain in detail what exactly phytic acid is and why there’s such a fuss over it. As always I’ll leave you with some tips to help you best innerstand how to utilize phytic acid and start protecting your cells immediately. With that being said I hope you are able to take away a few tips that help you to improve your current situation because honestly, we can all use some help every now and then! 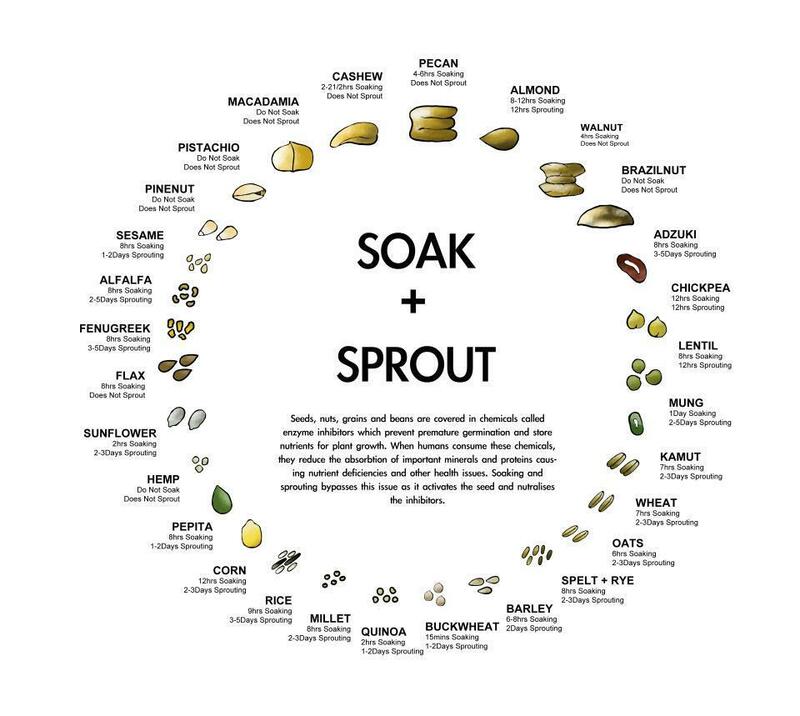 Here is a chart that gives some guidelines on the length of time to presoak and or sprout. NOTE: Most nuts will not sprout unless they are fresh, meaning recently harvested from the tree/plant/bush. If you’d like to learn about the businesses I run please visit the links below. I also have many friends that run their own businesses and I would be more than happy to connect them with you. If you haven’t already link with me on FB, IG, or Twitter and let’s share our resources and collaborate on how to build a sturdy foundation. Roots are the foundation of a plant. Roots create the stability and are the means by which a plant receives its nutrients, which enables it to grow strong and healthy. Without strong roots, the fruit will never reach your plate. MyCoCreations An eco-friendly consciously creative company that provides natural & organic health & body products, clothing, jewelry and more. Roots R Us If you want to improve your health, are ready to make a change in the way you eat & live but you need a little guidance support to help you reach that goal, we want to assist you! Technificent Consulting Using my passion for puzzles and technology to help businesses grow and expand, I’ve created a process where I take the stress of technology off your hands and put the pieces of the puzzle together for you so that your dreams and visions can become a reality. Healing Universal Garden Delivering organic, natural, non-GMO produce right to your door, visit us today and receive your H.U.G. in a box in just a few days! Arminda Mycocreations Colón liked this on Facebook. LaNita Nash liked this on Facebook. Healing Universal Garden liked this on Facebook.